GERM Services belongs to MAIZ EUROP group. 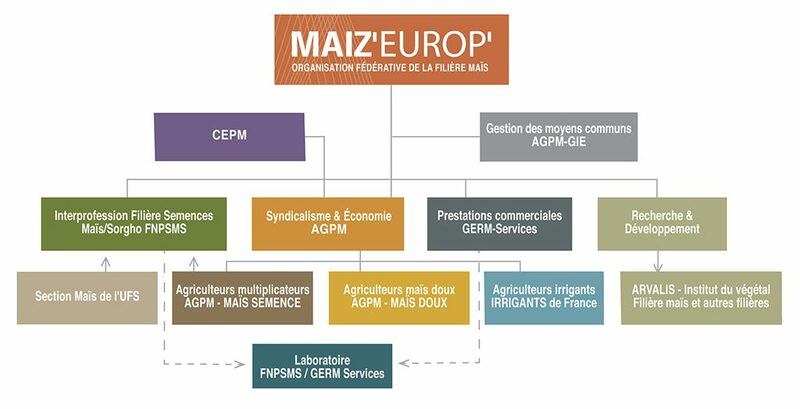 MAIZEUROP gathers the organizations of the french corn branch and also its extension called “European maize” through the CEPM. It stands of different types of organizations with totally different activities. Corn is the biggest culture in the word. In France, it comes second with a total surface of 3.15 million acres in 2015. The AGPM (General BOard of corn producers) created in 1934 is the main actor for the corn professional union through the representation and the promotion of corn and its producers to the French and European authorities. The headquarter of AGPM and its members is in Montardon, near Pau and can also be found in Paris along with other cereal organizations (AGPB, ARVALIS – Institut du Végétal, UNIGRAINS, France Export Céréales, Passion Céréales, FERT, Sol & Civilisation) ; there is also an office representing the CEPM in Brussels. Irrigants de France works for irrigators no matter whether they produce corn of other major cereals (oil or protein crops and potatoes). The FNPSMS (Fédération Nationale de la Production des Semences de Maïs et de Sorgho) is an interprofessional organization which gathers all the stakeholders in corn and sorghum seed production in France : breeders and seeds producers It deals with. the production of seeds in France, its development in France and abroad and ensure a representation role to the French and European authorities. CEPM is the european extension for the AGPM. CEPM’s purpose is to represent and defend the interests of European maize producers and to perform economical monitoring. GERM-Services The benchmark laboratoy for breeding and seed-trading companies, located in Montardon since 1951 plays a major role in the process of seed certification together with the official organisations. It also supports all the operators involved in the maize branch such as seeds producers, industrial companies and breeders for their analytic programs and quality process. The AGPM-GIE brings together the operating means at the service of corn branch ; it includes different departments such as accounts, quality, IT, human ressources and printing services; it is located in Montardon (South West of France). It is also in charge of the renovation of the Montardon site.